9/11 parted an unholy curtain to reveal the enemy of God and humanity as rooted in shame-based religion. That revelation has dramatically shifted the focus of warfare today from military battles to the hearts of men. To win this war, we must first face and overcome that very enemy in ourselves. Most Christian teaching for men today tells us what we should do, the terrible consequences for not doing it, and even the wonderful benefits of doing it. It's basic, Old Testament teaching. It’s truth without the grace Jesus brings that enables us to do it (John 1:17). We can't get our masculinity either from women or other fatherless men. This epic impasse is precisely the moment God has designed to reveal Himself as Father and to prepare men for our true destiny as His Kingdom warriors. Fight like a Man is not about how to be a man, but instead, knowing the One who rescues and restores men. You won't learn a technique here; you'll remember your longing for a relationship. You won't be exhorted to obey; you'll be invited to trust. You won't be commanded to do right; you'll be freed to be real. You won't be warned to be strong; you'll be promised your Father's strength. And if you're honest, you'll be battling for your life. 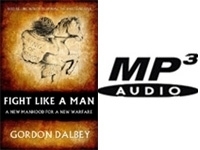 GORDON DALBEY pioneered the growing Christian men's movement in 1988 with his best-selling classic Healing the Masculine Soul. His Sons of the Father: Healing the Father-Wound in Men today portrayed the longing in men today for fathers and how Father God fulfills it. Fight like a Man aims at overcoming that wound’s shame, which suckers men into false religion and cuts us off from our true Father God and His victory in the battles of life.